As an artist, I seek to explore my emotional landscape and share it with you. With influences from Jean Baptist Basquiat, Cy Twombly, and the Wabi-Sabi aesthetic, new combinations of expression and mark-making have made my work reach a new level. Most of my paintings have a journalistic quality. You will see some words or phrases scattered here and there, and they are either exposed or layered under paint. Sometimes my words resemble scribbles, and only I know what I wrote. I use symbols as well, for they help me convey where I’m hoping to go or where I’m at emotionally. My marks and words are in black water-soluble graphite, and the lines vary from thin to thick. Black helps me anchor my paintings. Also, my paintings have a grungy, textural quality to them, so pristine paintings don’t appeal to me. I love imperfections, or Wabi-Sabi. My medium is acrylic mixed-media. Acrylic paint is incredibly versatile and works well with drawing tools. This enables me to keep loose and express myself whereas using one medium only would constrict me. I mostly work in a series. Working on one painting often makes me feel frustrated because I had way more to say. And lastly, I enjoy working on tiny wood cradled panels to large panels. 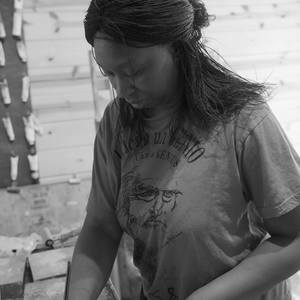 Keenya studied at the Brooklyn Museum, Pratt Institute and Fashion Institute of Technology and has taken many workshops under famed abstract painters and instructors, Julie Prichard, Chris Cozen, Faith Evans Sills and Mati McDonough!